Painted for Pete Goss MBE, Legion d’Honneur ; “I got exactly the painting I’d hoped for“. 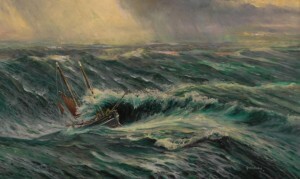 GOSS VOYAGE in the Southern Ocean CAPTURED ON CANVAS by Gordon Frickers, oils on canvas measuring 76 x 121 cms (30″ x 48″). “It’s the most expensive picture [print No 9] I’ve ever bought. Everyone who visits admires it. I’m so grateful you painted it, thank you so much” Ben Richards born and raised at Newlyn, now at West Looe. Looking for the best in marine art? You have found it here. As the Pete Goss press release put it: “The renowned marine artist Gordon Frickers has produced a painting that captures the epic voyage made by Westcountry sailor and adventurer Pete Goss MBE in 2008-2009 in the 37-foot long wooden boat Spirit of Mystery”. Fine marine art for sea people by Gordon Frickers. Pete Goss built and sailed the replica 37’ Mounts Bay Lugger to Australia to commemorate the incredible voyage made by seven Cornishmen in 1854 aboard the original Mystery, the smallest migrant vessel ever to make the perilous journey to Australia. You too could acquire or commission a painting of this quality. Available as a signed numbered print, with a limited number signed by Pete Goss; to make an order visit www.frickers.co.uk/art, payment page.